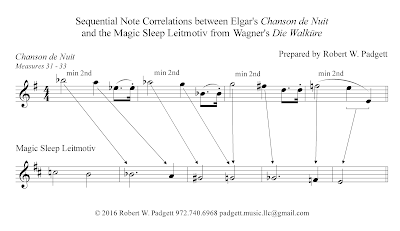 Elgar's Enigma Theme Unmasked: Wagnerian Leitmotifs in Elgar's "Chanson de Nuit"
Wagnerian Leitmotifs in Elgar's "Chanson de Nuit"
In his groundbreaking 1985 paper Elgar and Wagner, Peter Dennison identifies extraordinary parallels between motifs from Wagner’s operas and Elgar’s early choral works. Dennison astutely theorizes that fragments of Wagner’s music emanated from Elgar’s early music because of an intense and prolonged study of Wagner’s works. In 2008, Laura Meadows picked up where Dennison left off in her fascinating thesis Elgar as Post-Wagnerian: A Study of Elgar’s Assimilation of Wagner’s Music and Methodology. She makes a compelling case that Elgar was “profoundly influenced by Wagner from an early age and this influence gradually infiltrated his compositional thoughts.” She traces this influence to Elgar’s large-scale choral and orchestral compositions, overlooking comparably diminutive pieces such as those for solo violin and piano that apparently make no use of leitmotifs or other dramatic effects associated with Wagner’s operas. In March 1883, Elgar attended a memorial concert conducted by August Manns in honor of Wagner who had died the previous month. On the concert program, he penciled expression marks on the Siegfried motif in the Funeral March from Götterdämmerung. By 1889 his fascination for the Siegfried leitmotif blossomed into song as evidenced by the opening ten notes of Chanson de Nuit Op. 15 No. 1. 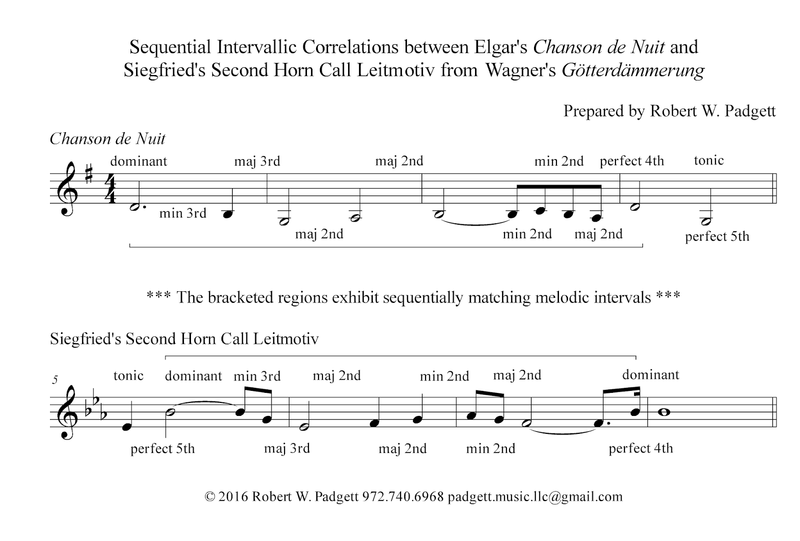 The first ten melody notes of Chanson de Nuit are drawn entirely from Siegfried’s Second Horn Call, a leitmotif from Wagner’s Opera Götterdämmerung. 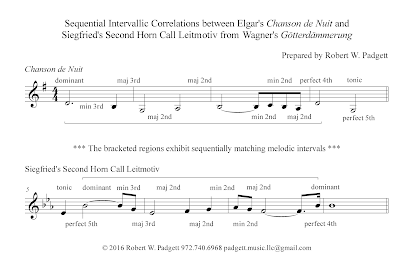 These opening melody notes are a virtual restatement of the Second Siegfried Horn Call leitmotif except for its first note which Elgar cleverly slips in at the end of the opening four-bar phrase of Chanson de Nuit. Never was it more truly said that mediocre artists borrow, but great artists steal. 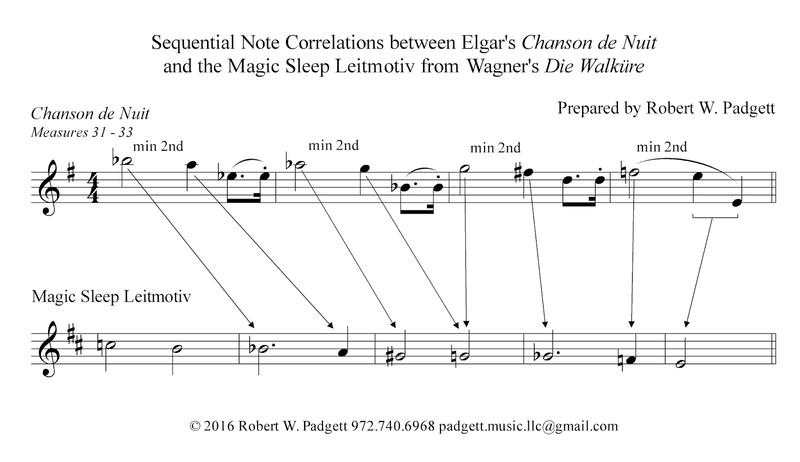 There is credible evidence that the contrasting secondary theme from Chanson de Nuit is modeled closely after Wagner’s Magic Sleep leitmotif from Götterdämmerung. Excluding the punctuated dotted rhythmic figures, the chromatic sequence of descending minor seconds closely mirrors the same note sequence of the Magic Sleep leitmotif. It is exquisitely appropriate that Elgar symbolically alludes to sleep in a song about the night. There are Wagnerian echoes. The Black Knight’s own motif is Klingorish. 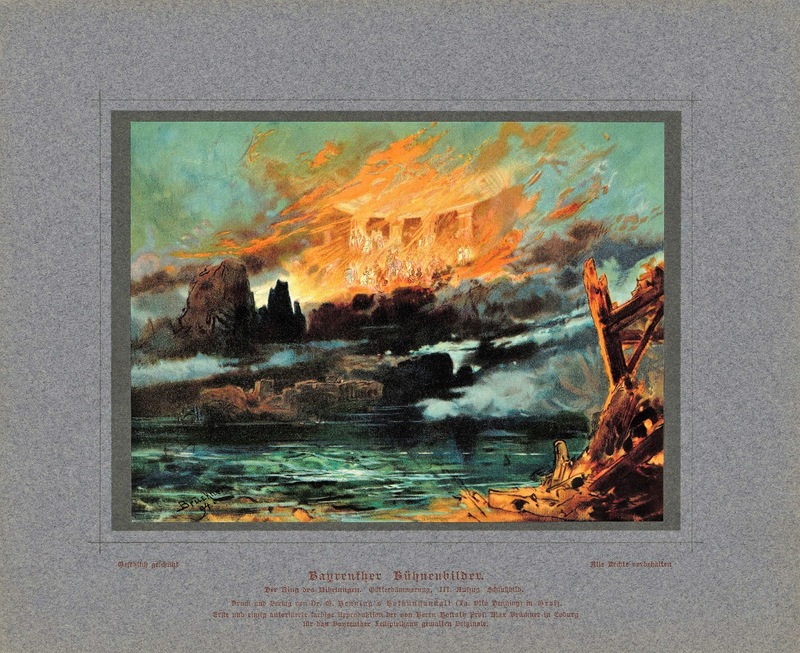 In Scene 2 the king’s castle rocks to a series of chromatic chords over bass tritones (the four bars before K, repeated before cue M) markedly like the version of ‘magic sleep’ as Valhalla burns in the final orchestral bars of Götterdämmerung. Elgar’s willingness to borrow from Wagner’s leitmotifs around 1889 for both Chanson de Nuit and The Black Knight marked the beginning of a far more ambitious enterprise that culminated in the Enigma Variations in 1899, for in that work he covertly quotes Ein feste Burg. In her informative thesis, Laura Meadows carefully catalogs concerts that Elgar attended or participated in as a sectional violinist between 1878 and 1911. She assembled this itemized list from Elgar’s personal collection of concert programs housed at the Elgar Birthplace Museum. Something remarkable about that list is how often Elgar heard performances of Ein Feste Burg before he composed the Enigma Variations in 1898-99. In 1890 Elgar played first violin in a performance Bach’s sacred cantata Ein feste Burg ist unser Gott BWV 80. In 1897 he was an audience member at a concert that included that same work. In 1883, 1886, and 1889, Elgar attended performances of Wagner’s Kaisermarsch which freely quotes Bach’s adaption of Luther’s hymn Ein feste Burg. Following the Enigma Variations, Elgar would later participate in a performance of Kaisermarsch in 1901. Like Bach and Wagner, Mendelssohn quotes Ein feste Burg in one his own works, the Reformation Symphony. Therefore, Elgar's decision to surreptitiously quote Ein feste Burg in his Enigma Variations pays silent homage to three giants of the German School: Bach, Mendelssohn, and Wagner.